Today I went to Berkeley with Twitter friend @iPeggy to meet with Analisa from the Corte Madera Town Center who we met at the Pacific Catch TweetUp. We met to talk social networking (my favorite thing to talk about). It was fun! Thanks to Peggy and Analisa I have now discovered Fourth Street in Berkeley. It’s a charming little street full of shops, cafés, book stores, a toy store and even a Chocolatier. Now, I’m wishing I would have remembered to take pictures at Chocolatier Blue, they had the most amazing organic, colorful, sparkly chocolates. Take a look here. 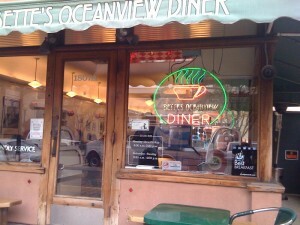 We had breakfast at Bette’s Diner which is like a blast from the past 50’s style diner. I had already eaten so I got a Chai Tea. The tea was really good. 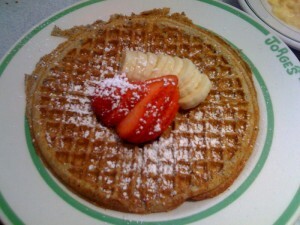 Peggy ordered a Buckwheat Waffle, it looked good and she said it was tasty. Analisa had a big bowl of Oatmeal with raisins. I was kind of wishing I hadn’t already eaten. After breakfast, Peggy and I decided to check out the Fourth Street scene. Peggy had to do some Christmas shopping for her little ones. 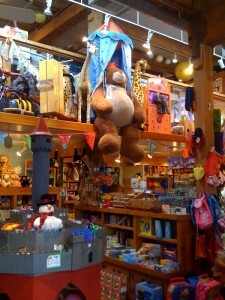 She took me to a really cool locally owned toy store called The Ark that specializes in “classic, imported, Waldorf-inspired, wooden and just all-around fun toys.” Doesn’t this toy store just look fun?! After the toy store I spotted the Chocolatier so we headed over there and had a Dark Chocolate Tart thing. Whatever it was, it was delicious! One last stop was the Crate & Barrell Outlet store. I have been saying for months years that I need new glasses. I do not have one full set of any glasses anymore. Hardwood floor + glass + me = a lot of broken glasses. I found the cutest glasses ever and they were on sale so I bought 8. 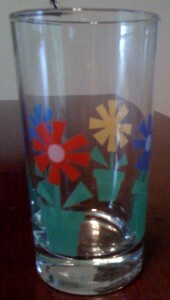 I now have 8 matching drinking glasses, imagine that! Dinner party time! Visit www.fourthstreetshop.com for more information about this area in Berkeley.